I am closing my Lawrence office as of December 15th, 2017 and am working full-time at my Overland Park location. Current Lawrence clients have been notified. 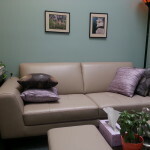 Previous Lawrence clients are welcome to meet me in Overland Park and/or obtain referrals to additional therapy services. I am now an in-network provider with Blue Cross Blue Shield of Kansas. Please note: this in-network status relates to my Lawrence office (not my Overland Park location). I moved my Kansas City office from Mission to Overland Park. See the contact page for more information. The new building is handicap accessible. Feel free to preview photos of the space. I am moving my Lawrence, KS office to 719 Massachusetts Street, Suite 113. The new building features a chair lift (helps people with disabilities get up the stairs) and nicer waiting room and bathroom facilities. Please contact me if you have any questions about the new space. My Mission, KS office remains the same.